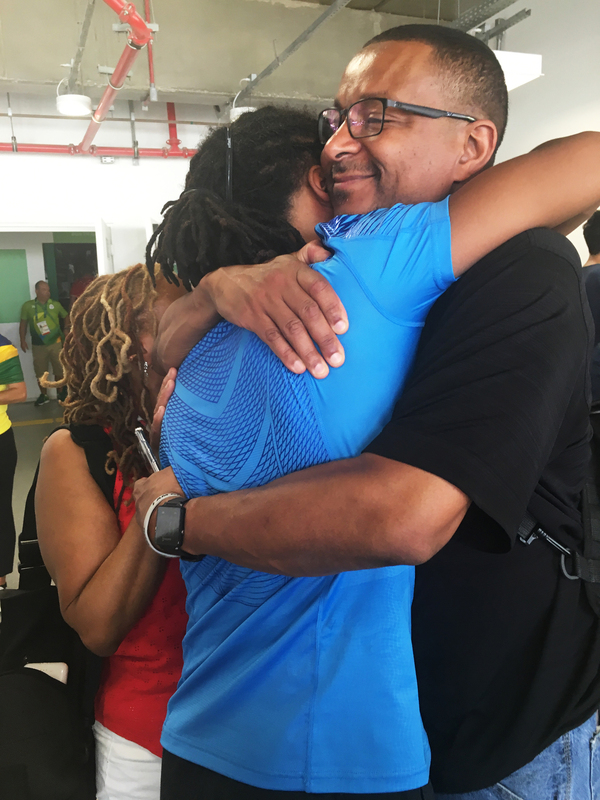 After Years Of Sweat, Fencer Jason Pryor Makes His Olympic Debut : The Torch In the days before his competition, Pryor said he had never been more ready for anything in his life. With his family watching, he faced a tough Swiss opponent in his opening match. 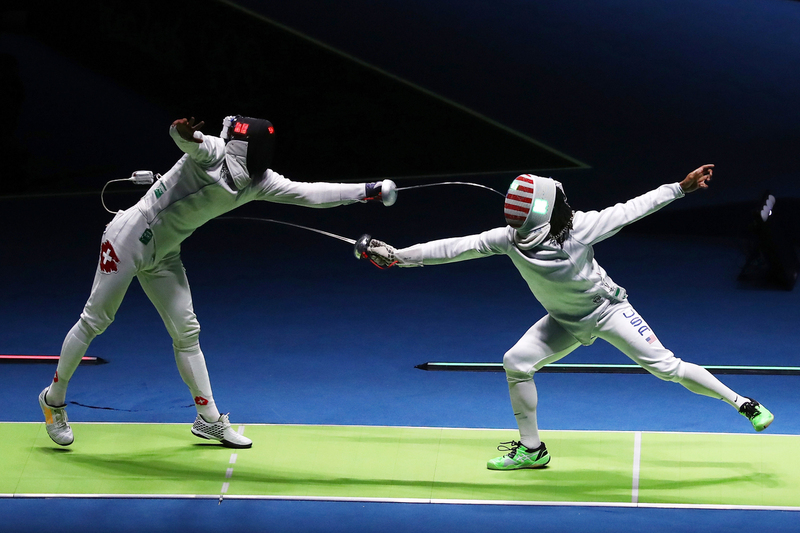 Jason Pryor of the United States (right) in action against Benjamin Steffen of Switzerland during the Men's Epee at the Summer Olympics. "He is one of THE best fencers in the world," Pryor says, anticipating the matchup. "So at this point, I just have to get rid of all that and decide to have a good day, because it's just another tournament." I watch Pryor's match with his parents, Eric and Brenda Pryor. They flew in from Ohio along with nine other family members from all around the U.S. who came to cheer Jason on. Jason Pryor (center) and his friend and fellow fencer Dwight Smith (left) take a break during training at the Fencer's Club in New York City on June 17. "(I'm a) proud, excited, and a very, very blessed mother!" Brenda enthuses as we waited for the bout to start. "I don't have buttons on my shirt anymore, just bursting!" Eric chimes in. "Yes, we're tremendously proud. " We take seats in the second row inside the Carioca 3 arena. Pryor enters in his white uniform, eyes fixed. He wears green shoes that match the fencing strip he's competing on. His face mask is emblazoned with Stars and Stripes. Pryor shimmies a little with the opening music. Mom Brenda bows her head for a quiet prayer. The match director says, "En garde! Allez!" and the bout is on. Pryor and Steffen dance and parry and lunge, their epees flashing. They're evenly matched, trading touches. The lights flash green when Pryor scores a point. Red for his opponent. The duel is to 15 points. Jason Pryor hugs his father, Eric, after his match on Tuesday. "This isn't the end," Jason says. "This is simply one competition." Brenda murmurs under her breath, "Stay loose baby, stay loose." Each time Jason scores a point, his parents rise out of their seats: "Yes! Yes! Yesssss!" When Steffen lands a touch, they urge Jason on: "It's all right Jason, you got this! One point at a time, Jase, one point at a time! Get it back." The score inches up: 11-12. 12-13. 13-14. It's match point. Jason is down by one. "Find a way Jason, find a way! Let's go!" But it's Steffen who scores the final touch. Jason Pryor's Olympics are over. He hugs his opponent. Mom and dad look wistful, but they're smiling. Really big. "Our son found a way to persevere," Brenda says after the match. "To rise to the level of excellence that brought him to this point. He is a true Olympian. The sport is better because of my son! That's how I feel." Eric Pryor makes his way to the railing to congratulate and shake hands with his son's opponent. Some time later, outside the arena, they finally find Jason. Brenda wraps her son in a gigantic hug. "Hi, my sweetie pie!" she says, kissing his cheek. "I'm so proud of you! We love you so much!" Asked about his match, Jason tells me, "Everybody here is a Type A personality who's obsessed with winning. So when you lose you're real, real, real salty." 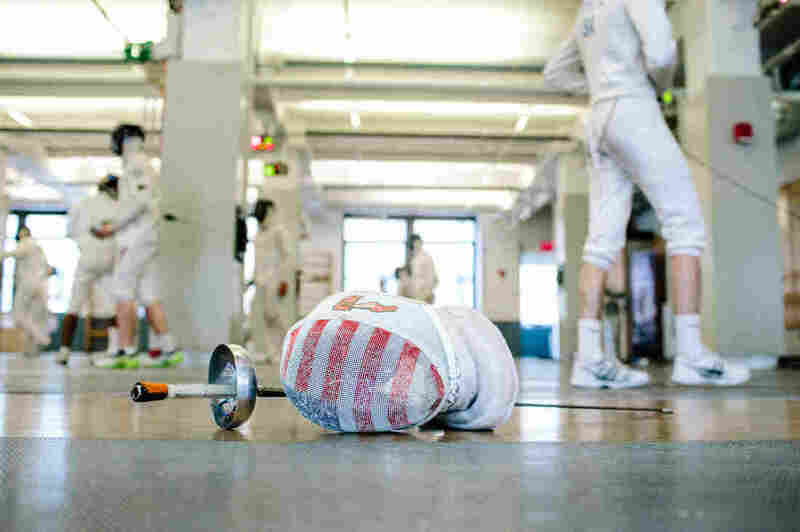 Pryor's mask and foil lay on the floor during training at the Fencer's Club in New York City on June 17. But he shakes off the disappointment. "What else are you gonna do? You can crawl into a little ball and cry about losing, but it's epee. It's 15-14. And this isn't the end. This is simply one competition," he says. At 28, Pryor is young. He's got lots more fencing in him. And this kid from South Euclid, Ohio is an Olympian. For right now, Brenda says, "we have some celebrationing to do!"